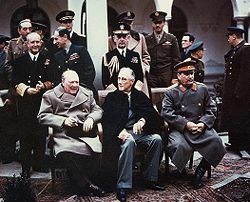 The Yalta Conference, sometimes called the Crimea Conference and codenamed the Argonaut Conference, was the wartime meeting from February 4, 1945 to February 11, 1945 between the heads of government of the United States, the United Kingdom, and the Soviet Union—Franklin D. Roosevelt, Winston Churchill, and Joseph Stalin, respectively. Following on the heels of the Tehran Conference, this meeting resolved a number of outstanding issues between the powers. A rift in the relationship between the two Western powers and their communist ally had already begun to develop as Stalin wanted Eastern Europe as a buffer zone, while Roosevelt believed he could help secure peace through Soviet participation in the United Nations. In the end, they compromised, allowing the Eastern bloc to fall under Soviet influence, and later Soviet dominion. In return, the Soviets did join the U. N., but as part of the compromise, several of their republics were granted nation status and they received a permanent seat on the United Nations Security Council. The results for Eastern Europe were disastrous as they were held hostage for half a century. The term "Western betrayal" was coined in several of these countries to describe the failure of the Western powers to live up to its claims to promote freedom and democracy throughout the world. On February 4, 1945 the Big Three (Roosevelt, Churchill and Stalin) convened at Yalta, on the Crimean Peninsula. It was the second of the large war time conferences, preceded by Tehran in 1943, and succeeded by Potsdam (after Roosevelt's death) later in 1945. After the Tehran Conference in 1943, the three leaders promised to meet again, resulting in the conference held in Yalta. Although Stalin had expressed concern about Roosevelt's health during the Tehran conference, this concern did not translate into action. The Soviet leader refused to travel farther than the Black Sea Resort of Yalta in the Crimean Riviera (then part of the Soviet Union) for the next meeting and, once again, Churchill and Roosevelt took long trips to attend the Yalta summit. "For the Russian people, the question of Poland is not only a question of honor but also a question of security. Throughout history, Poland has been the corridor through which the enemy has passed into Russia. Poland is a question of life and death for Russia." Accordingly, Stalin made it clear that some of his demands regarding Poland were not negotiable—the Russians were to keep territory from the eastern portion of Poland and Poland was to compensate for that by extending its Western borders, thereby forcing out millions of Germans. Stalin promised free elections in Poland, notwithstanding the recently installed Communist puppet government. However, it soon became apparent that Stalin had no intentions of keeping his promise of free elections. The elections, which were held in January 1947, resulted in the official transformation of Poland into a socialist state by 1949, though they were widely considered rigged in favor of communist parties. Roosevelt's concern about the Soviet Union entering the Pacific war on the side of Allies can be seen as misplaced. In fact, some argue that Stalin was anxious to reverse the humiliation and territorial losses during the Russo-Japanese War, and hoped to extend Soviet influence into East Asia. However there is some dispute as to whether Roosevelt would ever allow Soviet troops to land in Japan, as can be seen by President Truman's decision to drop the nuclear bombs on Hiroshima and Nagasaki, effectively preventing an invasion. Roosevelt met Stalin's price, hoping that the Soviets could be dealt with through the U.N. Some Americans later considered Yalta to be a 'sellout', because it encouraged the Soviets to expand their influence into Japan and Asia and also because Stalin eventually violated the terms by forming the Soviet bloc. Furthermore, the Soviets agreed to join the United Nations given the secret understanding of a voting formula with a veto power for permanent members in the Security Council, thus ensuring that each country could block unwanted decisions. Some critics suggested that Roosevelt's failing health (Yalta was his last major conference before he died from a cerebral hemorrhage) was to blame for his seemingly poor judgment. At the time, the USSR had troops in much of Eastern Europe with a military about three times as large as Eisenhower's forces. The Big Three had ratified previous agreements about the postwar division of Germany: there were to be three zones of occupation, one zone for each of the three dominant nations (France would later get a portion when the USA and Great Britain divided up parts of their zones and gave them to France). Berlin itself, although within the Soviet zone, would also be divided into three sectors, and would eventually become a major symbol of the Cold War because of the division of the city due to the infamous Berlin Wall, constructed and manned by the Soviet-backed Communist East German government. "The establishment of order in Europe and the rebuilding of national economic life must be achieved by processes which will enable the liberated peoples to destroy the last vestiges of Nazism and fascism and to create democratic institutions of their own choice." In postwar Europe, Russia would gain the southern half of the Sakhalin Islands and Kuriles, and the northern half of the German province of East Prussia. The nationalists and anti-communists in the Eastern European nations often regard the Yalta Conference as the “Western betrayal.” This is due to the belief that the Allied powers, despite venerating democratic policies, sold out the Eastern Europeans to ensure their own prosperity over the next 50 years. The meetings of three leaders took place in the Grand Livadia Palace. The conference was held in Yalta, a resort town on the Crimean peninsula in the Soviet Union (now in Ukraine). 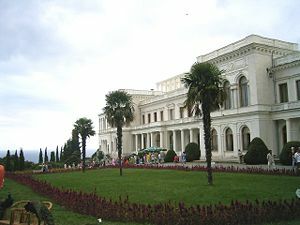 The American delegation was housed in the Tsar's former palace, while President Roosevelt stayed at the Livadia Palace where the meetings took place. The British delegation was installed in Prince Vorontsov's castle of Alupka. Key members of the delegations were Edward Stettinius, Averell Harriman, Anthony Eden, Alexander Cadogan, and Vyacheslav Molotov. According to Anthony Beevor, all the rooms were bugged by the NKVD. Stalin arrived by train on February 4. The meeting started with an official dinner that evening. There was an agreement that the priority would be the unconditional surrender of Nazi Germany. After the war, Germany would be split into four occupied zones, with a quadripartite occupation of Berlin as well. Stalin agreed to let France have the fourth occupation zone in Germany and Austria, carved out from the British and American zones. France would also be granted a seat in the Allied Control Council. German reparations were partly to be in the form of forced labor. Creation of an allied reparation council with its seat in Moscow. The status of Poland was discussed, but was complicated by the fact that Poland was at this time under the control of the Red Army. It was agreed to reorganize the Provisionary Polish Government that had been set up by the Red Army through the inclusion of other groups such as the Polish Provisional Government of National Unity and to have democratic elections. This effectively excluded the legitimate Polish government-in-exile that had evacuated in 1939. The Polish eastern border would follow the Curzon Line, and Poland would receive substantial territorial compensation in the west from Germany, although the exact border was to be determined at a later time. Citizens of the Soviet Union and of Yugoslavia were to be handed over to their respective countries, regardless of their consent. Roosevelt obtained a commitment by Stalin to participate in the United Nations once it was agreed that each of the five permanent members of the Security Council would have veto power. Stalin agreed to enter the fight against the Empire of Japan within 90 days after the defeat of Germany. The Soviet Union would receive the southern part of Sakhalin and the Kurile islands after the defeat of Japan. Millions of Soviets across Europe were forced to return to the Soviet Union under Stalin's Communist rule. A "Committee on Dismemberment of Germany" was to be set up. The purpose was to decide whether Germany was to be divided into several nations, and if so, what borders and inter-relationships the new German states were to have. Yalta was the last great conference before the end of the war in Europe and was the last trip Roosevelt took abroad before his death. To observers he appeared already ill and exhausted. Arguably, his most important goal was to ensure the Soviet Union's participation in the United Nations, which he achieved at the price of granting veto power to each permanent member of the Security Council. Another of his objectives was to bring the Soviet Union into the fight against Japan, as the effectiveness of the atomic bomb had yet to be proven. As a reward, Soviet Union was allowed to seize the Sakhalin Peninsula and the Kuril Islands, which were under Japanese sovereignty, and some other privileges in colonial China remained intact. The Red Army had already removed Nazi forces from most of Eastern Europe, so Stalin obtained his goals—a significant sphere of influence as a buffer zone. In this process, the freedom of small nations was sacrificed for the sake of stability, which meant that the Baltic countries of Latvia, Lithuania and Estonia would continue to be members of the USSR. ↑ Overview The Yalta Conference (1945). Retrieved June 10, 2016. ↑ II. DECLARATION OF LIBERATED EUROPE The Yalta Conference, February, 1945. Retrieved June 10, 2016. The Division of Europe Online Documents Collection. Special German series 2. The Committee on Dismemberment of Germany Allied discussions on the dismemberment of Germany into separate states, March 29, 1945. Yalta casts its shadow 60 years on, BBC. This page was last modified on 10 June 2016, at 19:10.